Just a short post today as I have an OU Geology exam in a couple of weeks with a stack of revision for that plus a load of reading and a reflective log to write for my PACT course. 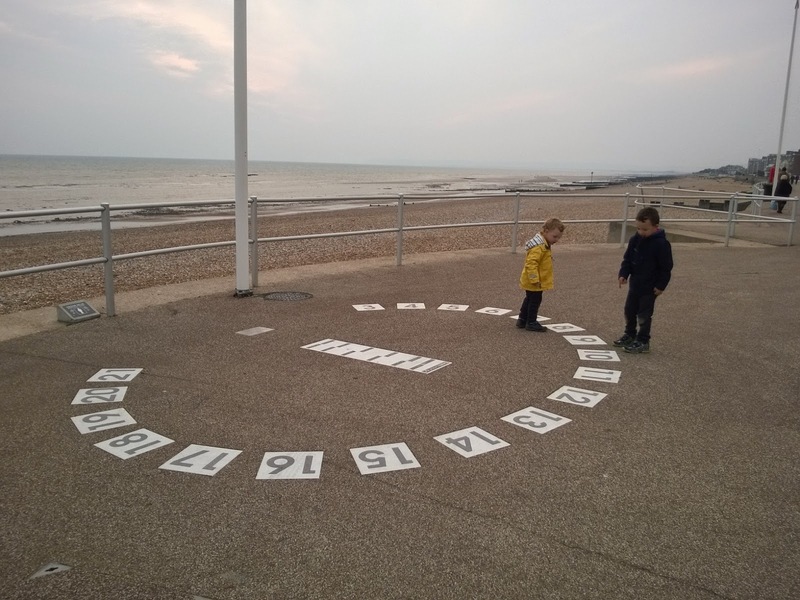 We took the boys to the beach this evening to blow away the cobwebs and found this great sundial - perfect for all sorts of number games. The tying together of a cognitive skill such as counting and a physical one such as jumping seems to be a fantastic way to help our brains to learn. For Toby this is a simple game of jumping on 1, 2 and 3, or looking for those characters in other numbers. For Ollie we are starting to move beyond counting in single numbers to counting in multiples by jumping from 2 to 4 to 6 and so on. This was an unplanned game resulting from numbers we found, but other old favourites such as hopscotch exploit exactly the same principal of learning numbers while doing a physical activity. A brilliant idea I saw on the site 'no time for flash cards' had kids doing number recognition and maths by throwing water balloons on to numbered targets.